Is Nokia planning a mobile phone that can generate battery life purely by the power of movement? As any smartphone user knows, once you’ve checked your Facebook account, sent a couple of emails and made some calls, your phone’s battery is already beginning to fl ag. Nokia plan to change that charge-every-night ethos by creating a phone that’s charged by your movement. A patent the Finnish company has filed shows plans for a mobile phone that utilises the energy created as you move to power it, much like kinetic watches have done on a smaller scale for years. It does so using piezoelectric crystals, which create an electric current when bent or compressed. Previously these crystals could only be created at high temperatures, but a breakthrough by scientists from Princeton and MIT suggests they could be printed onto rubber, making them suitable for mobile phone components. “In our watches, the wearer’s movement causes an oscillating weight to spin, which generates a magnetic charge through gearing,” says Mark Willingham, national account executive at Seiko, who pioneered kinetic watches in the 1980s. 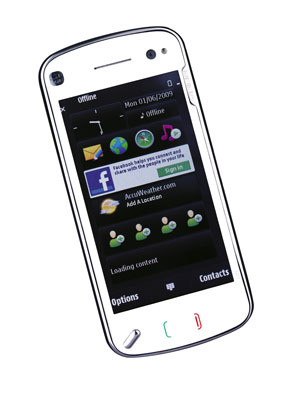 Nokia’s phone would use a variant of this technology – see “How it works” for details. Obviously a phone requires more energy than a watch, and whether general, day-to-day movement would create enough power to run one is open to debate. Heavier components such as the radio aerial and battery are placed on a frame that sits on rails that allow them to slide up and down, or left to right. Each rail contains strips of piezoelectric crystals that create an electric current when hit and compressed by the frame. So any movement of the phone generates electricity, charging the capacitor and keeping the battery topped up. Victorinox recently launched two new versions of its classic Swiss Army Knife in India. Called the Soldier and the Nomad, both these variations feature everything that the cult product had, albeit with a few tweaks. The Soldier is a rank up with extra features like a one-hand opening serrated locking blade and a wood saw. The Nomad scores on looks with its bright red colour. 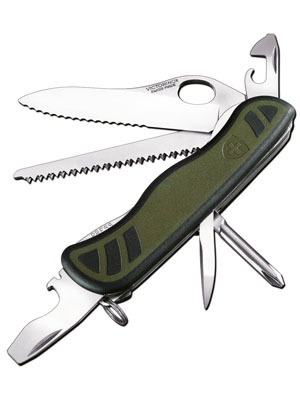 Capable of doing at least 30-34 functions, or so Victorinox claims. Prepare to put these to the test soon! 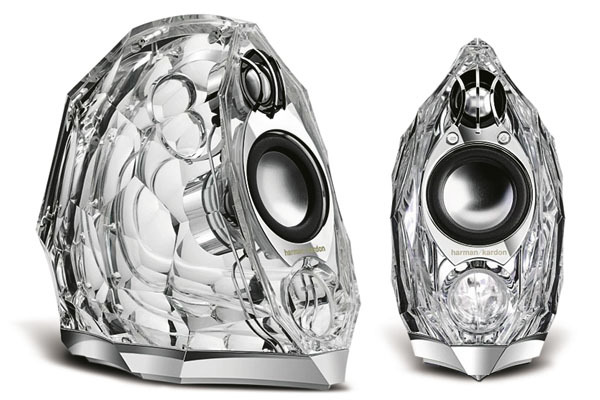 These clear speakers look like they’re carved from a block of glass and they’re named GLA-55. Pretty clever wordplay, huh? Bold design choices aren’t the only reason to give them space on your desk; they also pack 55 watts per channel of digital amplifi cation, DSP equalisation and patented CMMD tweeters and Atlas drivers. As you’d expect for this price, the sound is superb. Rs 60,000*. Crafted as a tribute to the desert paradise King Nebuchadnezzar II constructed for his wife Amytis, Hanging Gardens of Babylon is the fi fth member of Pelikan’s “Seven Wonders of the World” series. This piston-fi ller fountain pen is a dazzling display of artistic craftsmanship in dark green lacquer with generous gold-plated accents. What’s unique about this pen is the intricately detailed cap that depicts the four-stepped terraces. The handcrafted, 18-carat gold nib engraved with a stylised terrace is also an eyecatcher. Limited to 410 pieces, this is your chance of owning a wonder. The Celle Chair from Herman Miller looks great, and by having a high ergonomic quotient, functions even better. Created by Jerome Caruso, the design, comfort and attractive pricing make Celle the right chair for a wide range of environments. The cellular suspension system, developed specifically for it, creates a flexible framework that supports you with the same kind of buoyancy that you’d feel if you could sit on water. The unique harmonic tilt allows for a range of reclining. Celle is available in a refreshing range of colours, is 99 per cent recyclable, and can be disassembled in less than five minutes. But you won’t be recycling this durable chair anytime soon. 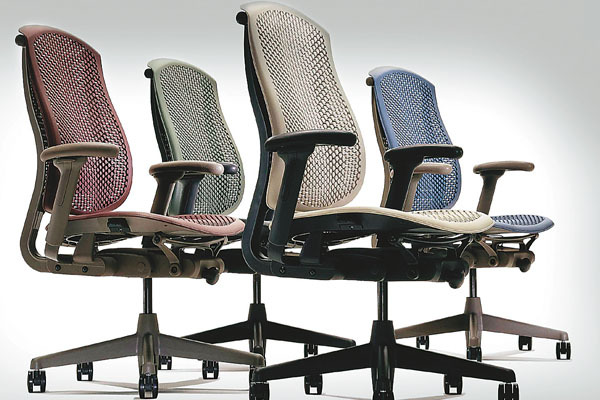 Celle is covered by Herman Miller’s 12-year, 24-hour-a-day warranty! The first time you used an iPhone you probably marvelled at how slick the touchscreen was. Well there’s a new screen technology coming that’ll make an iPhone look like a toy. This new tech can detect how hard you’re pressing. So the harder you press before you fl ick, the faster it’ll scroll through your music library. Your character in a video game will run faster or punch with more force, depending on how hard your prod is. It uses a material known as Quantum Tunnelling Composite (QTC) and works like this: think of the screen like a sheet of paper over the top of a glass. You press the centre and the edges distort by a tiny amount. 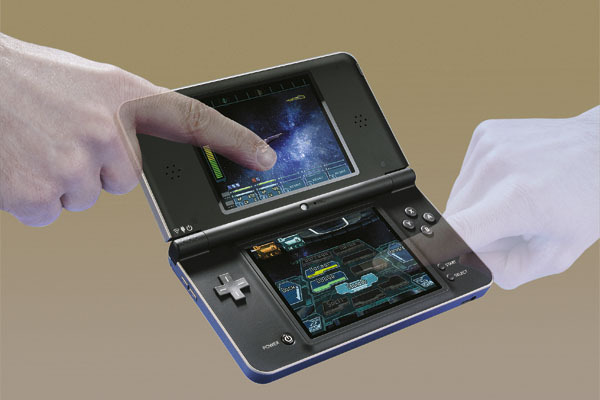 By placing about ten sensors around the edge of the touchscreen, the device is able to read how hard you’re pressing. This means that software will know exactly what you’re doing. Scrolling long web pages will be easier, and painting programs could give thicker brush strokes the harder you press. Described as “art furniture”, the reassuringly expensive Time Table is lavishly handcrafted to resemble a giant watch. The nickel-plated face is protected by toughened glass, while the rosewood top section is fi xed to a wrist strap-inspired leather stand. 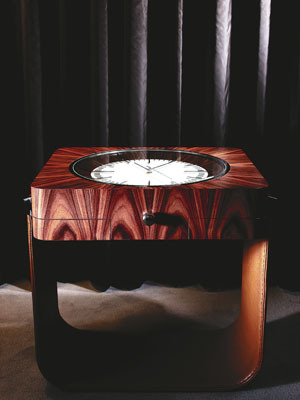 For well-heeled horologists and those with freakishly large wrists, there’s no finer coffee table.